You can use some form of action call graphics in your website, webinar or PowerPoint presentation of your key business project. Here we share ideas on how to apply call to action button on a slide in a creative way. In the world of online marketing, the call-to-action buttons are proved to work element of landing pages. Such button is aimed to provoke and get an immediate response from webpage visitor. Every good presentation should lead to some change. The buttons can be added to any part of your project. If you use it at the beginning – you attract audience attention, at the end – make a laconic ending. Presented below the call to action buttons will help you to motivate the audience and get direct feedback. 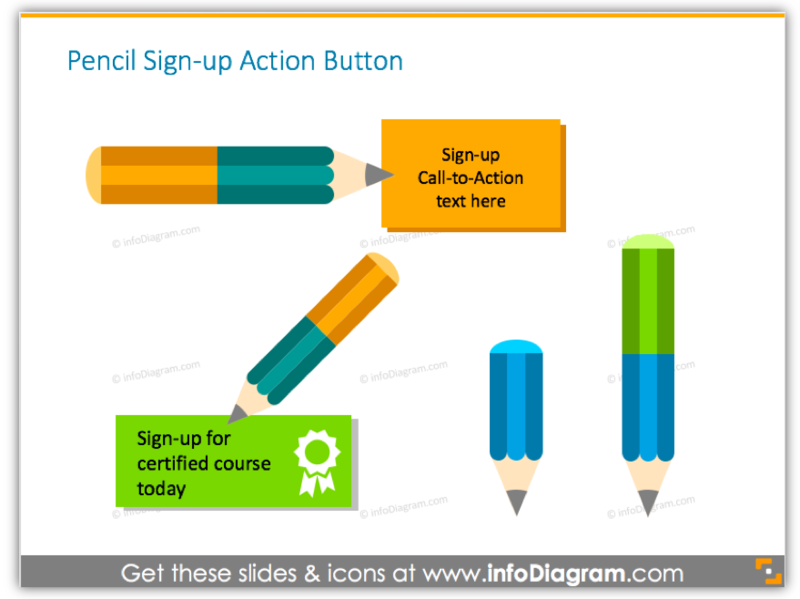 Remark: You can get all slide templates from Call to Action Buttons collection. Call to action buttons are handy for the managers, presentation creators, and marketers. This tool will focus your audience attention and drive them to the next step. That’s why it helps your company to promote and sell a product or present an idea. Adding a call to action button in your presentation will help you to create a dialog with the client. It helps better understand your customer needs – seeing to what action call they respond. Above you can see the sign-up button illustrated with a pencil in different colors. Thanks to this unusual design you can provoke your audience to sign-up to your website or blog. This call to action button will serve you as a practical tool on your website, for example. 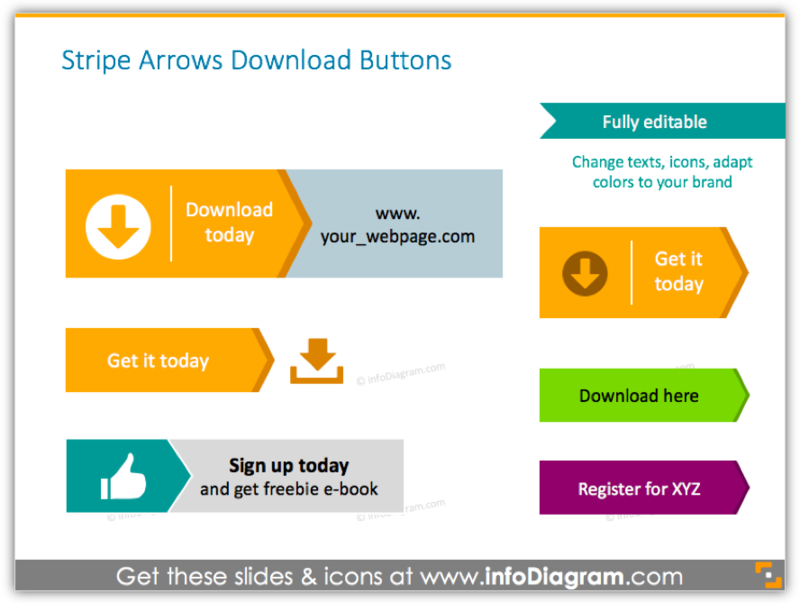 The download buttons are intended to redirect people to get some file – a freebie ebook perhaps, from your website. It’s telling the users what you want them to do when they visit your site. We designed a few versions of download buttons: illustrated with stripes, icons and only text. Thanks to the vivid color design of call to action button it’s more likely to get attention and prompt results. These graphics can be used when you want people to register on your site. Thanks to creative design this colorful buttons can’t stay unnoticed. You can also use them to motivate readers to buy your product – even today ;). These buttons are illustrated with simple flat icons and short text description. Rounded arrows are another creative variation of a call to action buttons. The smooth shape of the arrow can represent a personal friendly approach, unlike sharp square edged button above. Arrows are usually perceived as a vector which people should follow. That’s why applying such buttons will help your target audience make the order quickly and easier. You can make similar shapes in PowerPoint, using standard shapes and a few design tricks. Or you can adapt existing button from our PPT collection. Once you have button design you like, you can easily export it to a bitmap picture. And upload it to any website or material you need. Save and use the PNG picture wherever you need. 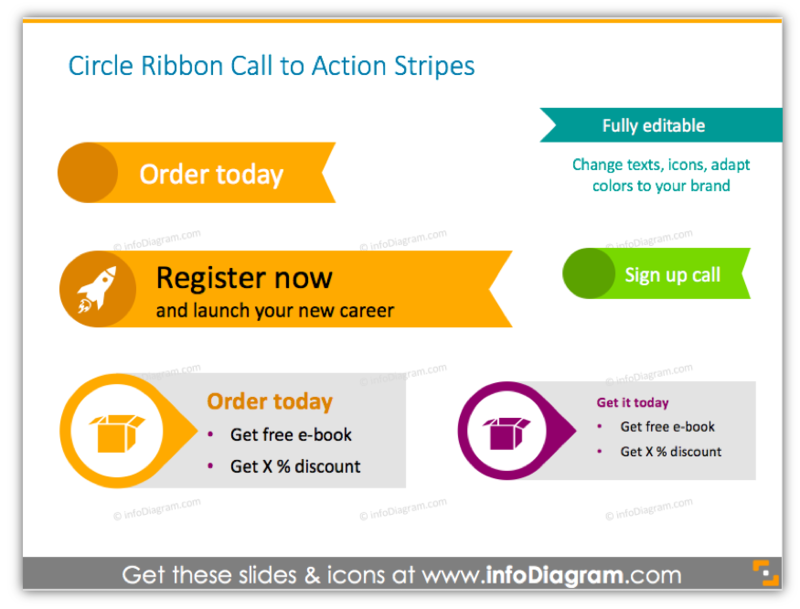 We demonstrate the most universal and useful examples of call to action buttons: circle ribbon buttons, rounded arrows, download button, pencil sign-up action and stripe button. Download, sign-up, register buttons are a way to direct focus, to do an action or move to the next step. This action buttons will help your visitors to save time and drive them to the target webpage. Including a call to action buttons in your content is the best way to provoke readers or listeners to take the next step. One click gives them a way to dip into your subject and get new information. Call to action buttons are an irreplaceable tool if you need to get more traffic or make your readers stop on your product. Remember: without a properly designed button, your landing page is doomed to fail. 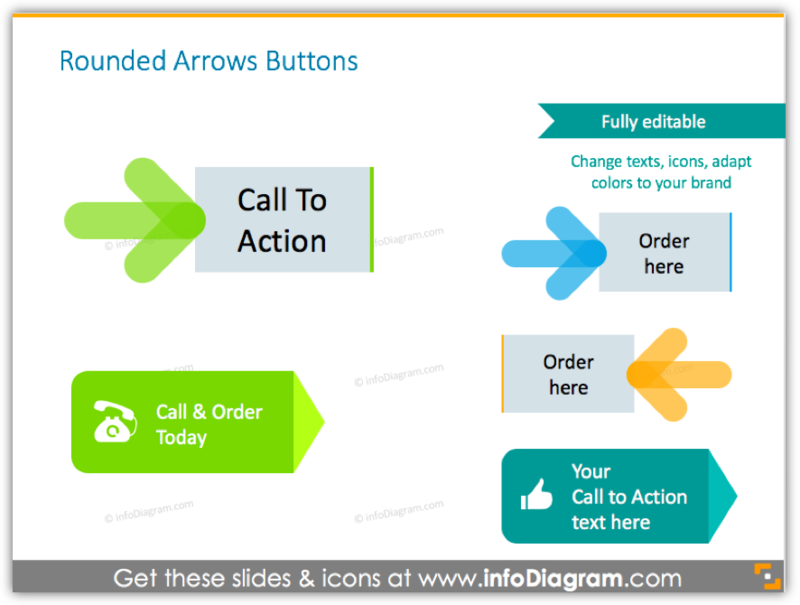 To help you out with making your action calls, we designed a PowerPoint file with a set of predesigned button shapes. The presentation includes examples of common marketing call to action phrases. You can use PowerPoint to design your own creative call to action button, with your text. For example, the artistic looking watercolor, if you want to catch attention. Or modern vivid green or orange flat buttons. Like our slide examples? Visit our PPT flat graphics resources website to see more creative graphics.